Each new year brings its own challenges. It is how we meet those challenges that says a lot about our character. I, for one, love a good challenge. 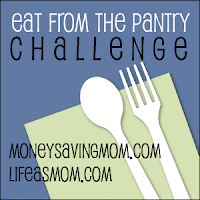 Money Saving Mom and Life as Mom have teamed up for the Eat from the Pantry Challenge. Throughout the month of January, they’ll be making all their meals from their pantries – using up their stockpiles from the cupboards and freezers and finding creative ways to concoct tasty meals. Their goal is to stay out of the grocery stores as much as possible during the month of January. “If possible, consider setting aside the money you save by participating in this Challenge and either applying it towards debt, putting it into savings, or donating it to a worthy cause. I think this is a great idea. I won’t be participating in the full month of the challenge because, quite honestly, I just have too many balls in the air right now to devote a lot of energy to a whole month of creative cooking. But I do plan to try it for a couple of weeks to get me back in the spirit of frugality! I’d encourage you to take on the Eat from the Pantry Challenge even if it’s just for a week. I think you’ll be surprised at how a little creativity can help you save a lot of money.